Would you like to know how is team rating overall calculated or which players you should use to complete a specific squad building challenge for the lowest price possible? Do you know what bronze benching is? 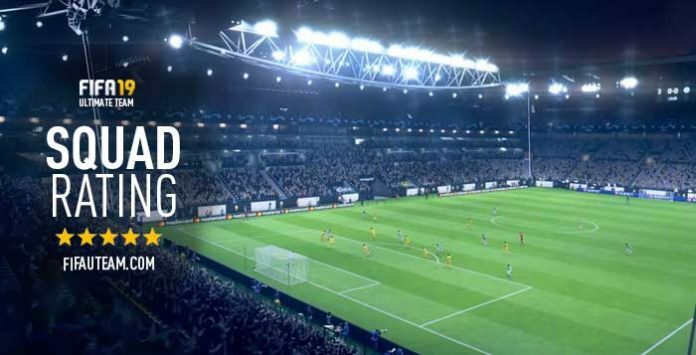 Well, all these things and much more are explained in our FIFA 19 squad rating guide. 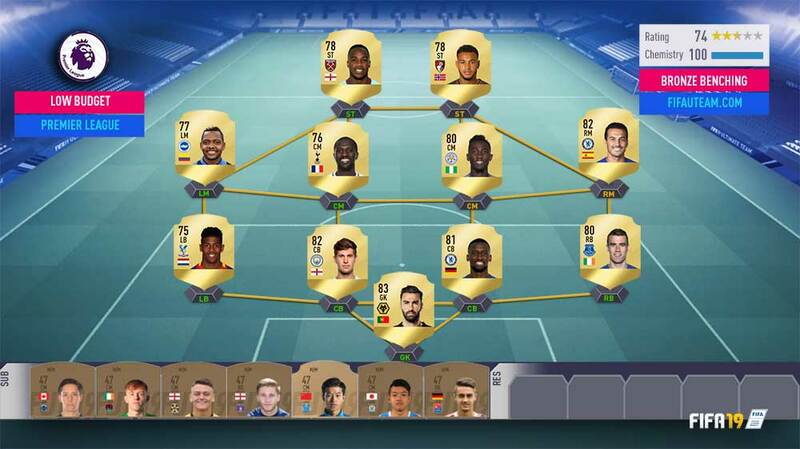 What is the FIFA 19 squad rating? This measurement is made through each player’s individual rating/overall in a team (all starting eleven plus the seven substitutes). It is, then, a little subjective, because a player with the highest rating is not always the best player. The FIFA 19 Squad Rating varies between 0 (worst) and 99 (best). As the image illustrates, this number is shown on the superior right corner of the active squad menu. In this case, the team rating of our squad is 0. If you want to know the team rating of your squad, check it in your console, companion or web app. 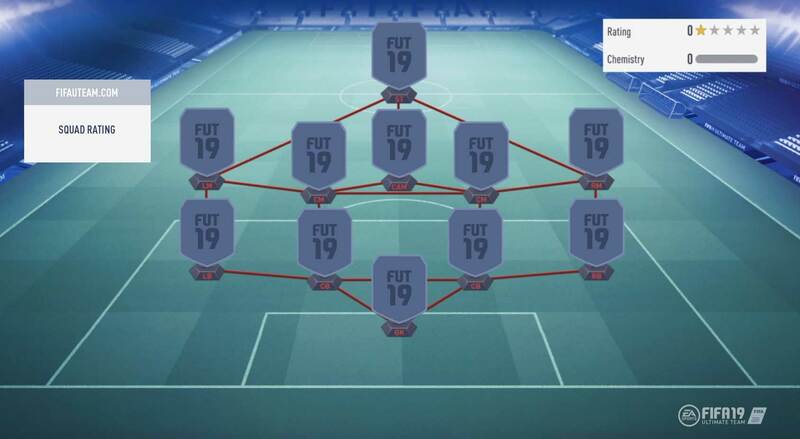 Do not use squad builders, like FUTHead or FUTWiz, because the way how they calculate the FIFA 19 Squad Rating is not 100% right. Besides measuring the quality of the team, the FIFA 19 Squad Rating also provides another general rating: the Star Rating. The Team and Star ratings are related as the table shows. How is FIFA 19 Squad Rating Calculated? The Team Rating is basically the result of the average between all 18 players’s overalls plus a correction value. This correction value is there to give different weights to the starting eleven, providing them more importance than the players that start on the bench. The way how FIFA 19 squad rating is calculated is not well known by the FIFA players community. For this reason, we will share it with you, trying to make it as simple as we can. In order to find out the team rating you just need to know each one of the starting eleven and substitutes’s ratings. As it was said here, the first step is to calculate the average between all these 18 players’s ratings. You just need to sum all those ratings and then divide the result by 18. Each player whose rating is superior to the average contributes positively to the correction factor with the difference between these two numbers. For the substitutes, this factor is divided by two. Remember that, only players with ratings higher than the AR can be used to calculate the CF. 6 Round down to get the final FIFA 19 squad rating by the formula. To make the things easier, we will look to an example of a Premier League squad without substitutes, just like it happens on Squad Building Challenges. We suggest to use this guide or the EA’s concept squad building when you want to test team ratings. Consider the team shown on the image above. The starting eleven’s ratings are: 83, 82, 81, 80, 75, 82, 80, 76, 77, 78 and 78. This is extremely easy. Add up all these numbers together and you’ll get 872. Divide it by 11, then you get 79.27. The correction factor equals the difference between each player’s rating and the average you got at step 2. When a player’s rating is equal or lower than the average, like it happens in this case with Sissoko, we assume that the difference between them is zero. Therefore, CF = ((83-79.27)+(82-79.27)+(81-79.27)+(80-79.27)+(82-79.27)+(80-79.27)) = 12.36. Then, you divide 884 by 11: 884/11 = 80.36. 80.36 -> 80. That’s the final squad rating. What affects the FIFA 19 squad rating? For those who are not very good at math, we gathered here some conclusions you can get from the FIFA 19 Squad Rating calculation in order to tear down a few myths. ✔️ When you add a better player to your squad, it is guaranteed that the team rating will not drop. How to meet the SBCs requirements? 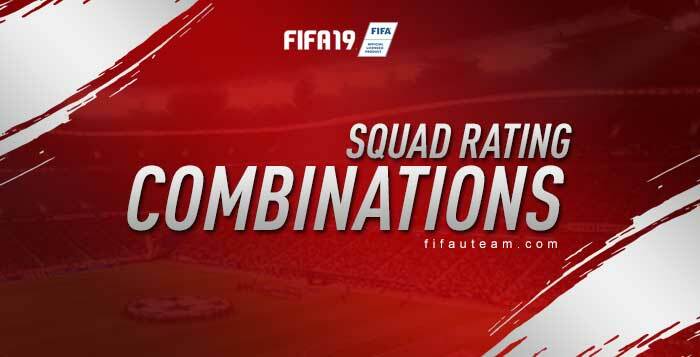 The FIFA 19 Squad Rating Combinations are too long to be published on this page. How to play against weaker opponents? 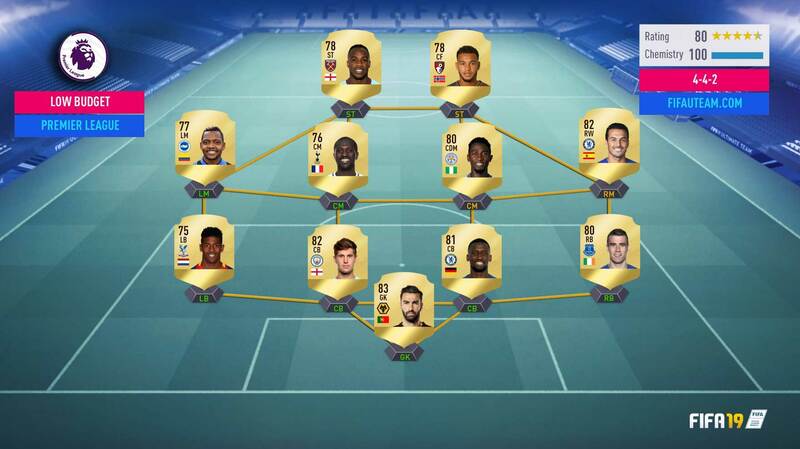 Star Rating, which gets its results from the FIFA 19 Squad Rating, is important for matchmaking. This is the game system responsible for finding your team a fair opponent. One of the considered factors is the Star Rating. Pairing two players who have a similar team value is its role. If you don’t like to play against strong teams, then you just have to artificially lower your Star Rating to the minimum possible without having to lose any players you intend to use. If you already learned how to calculate the Team Rating, then we don’t need to go any further. There is an excellent trick that will help you to find potentially weaker opponents. Do you want some help? OK. Go to the auctions market and buy 7 low-rated players. The lower, the better. Have you ever realized why unpopular players like Shandon Baptiste and Josef Hefele are so expensive? That’s because they are some of the lowest-rated players of the game, and many people are already using this trick. You don’t have to buy these ones because they are too expensive, but try to buy players with the lowest overall rating possible. Place them on the bench and play with your best starting eleven. If you feel like you need to place better players on the bench, do it, but know that because of this you’ll be facing an opponent with a stronger team. This trick is also known by bronze benching. It is usually implemented by players with very high rated squads in order to bring down the total overall rating. These players have their own reasons to do it: some believe there is a handicap when it comes to the overall squad rating; others believe they get matched up against similarly rated squads. Despite being very useful for many players, this trick has its disadvantages. One is that most of the times, opponents who have weaker teams end up being tougher. A loss in these situations may demoralize a player, making him weaker for the next matches. Another disadvantage is all the work you have to go through in order to reorganize the team. Searching your club for other players will be frequent because of potential player injuries and suspensions. Besides that, there’s that obvious disadvantage of not being able to make good substitutions in a match. Finally, if your connection isn’t very good you may end up facing a player with a better star rating than yours. If you’re aware of this method, know that it’s possible to reach considerable star rating changes for your team. We tested adding the seven lowest-rated players of FIFA 19 Ultimate Team to the starting eleven we used above to show how the team rating is calculated. The result was an impressive team rating decrease from 80 to 74, which means that the star rating also changed from 4.5 to 3.5 stars. Step 3 is not correct. It is necessary to perform rounding according to the rules of mathematics. The result of the operation will be 12. For example, if 12.51 were issued, the result would be 13. Probably depends on the game mode you are playing.